A deck, a devotion, and a heavenly scone = a lovely Saturday morning. I made these in honor of my friend, Pat Reynolds, who loves scones, and who told me last week that she is going home to heaven soon. I wanted to argue with her. We have not done all the fun things we had planned; antique shops, tea rooms, flea markets, but Pat is in her eighties and has been very ill for the past few weeks. And all the enjoyable times we have had or could have had are but a speck of dust compared to what our Father has in store. Who am I to argue? I’m thankful for the time we have had, the friendship that developed, and all I learned from Pat. I promised to make her some scones. So, here they are, Pat. At least you can enjoy the picture and know that I keep my promises. Scones are not as daunting as most people think. I created this recipe for the freshness of spring’s first fruits, and I’ll share the recipe with you. 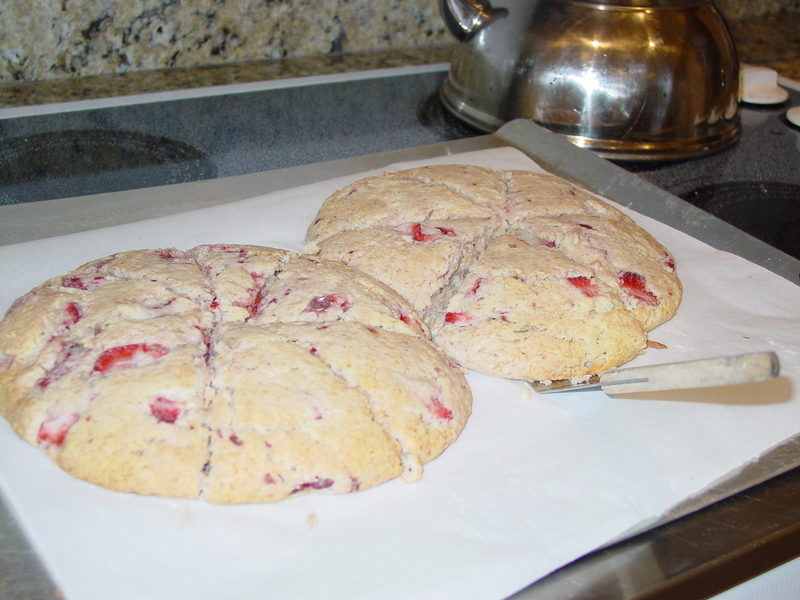 A great thing about scones is that you almost always have the ingredients on hand. Directions: Preheat oven to 375. Line cookie sheet with parchment paper and set aside. Place a long piece of parchment, foil, or waxed paper on your counter top and sprinkle generously with flour. In a large mixing bowl, mix dry ingredients and rosemary. Add cold butter by cutting it into small pieces. 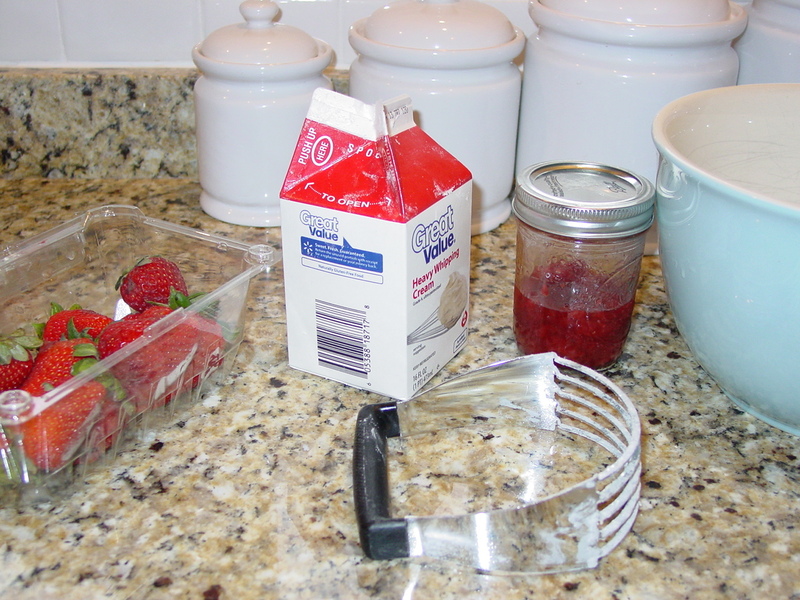 Use pastry blender (you could use the pulse mode on your food processor) and cut the butter into the dry ingredients. Cut in until the mixture looks kind of like corn meal with tiny peas in it. Gradually add the cream and stir until you have a sticky mixture. Divide it into two halves and turn one half out onto your floured sheet. When it is coated with flour, turn it over and coat the other side. If the flour is too thick, brush it off. You just want it dusted so that you can pat it out a little. Do the same to the other. You will have two medium circles to transfer to your cookie sheet. Using a knife dipped in flour, cut each circle into wedges (6 or so) being careful to NOT cut all the way through. You just want an indentation when the scones bake. They should look like this when you take them out of the oven. As they cool, make the glaze. Drizzle the glaze over slightly warm scones. 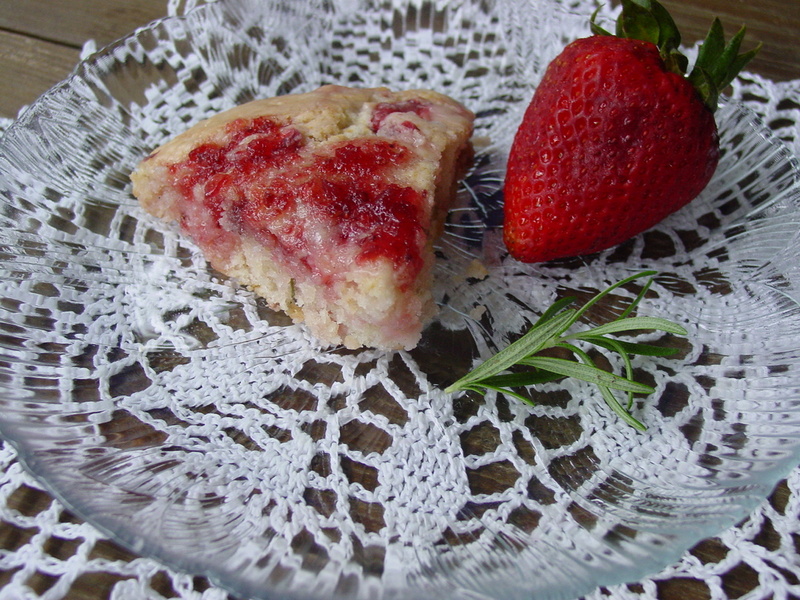 Placed on a glass dish with a sprig of fresh rosemary and a luscious strawberry and a vintage doily…who could resist? Saint and I couldn’t! I’m putting the rest in the freezer because they are “almost” as good reheated. I don’t think Lance, Tiffany, and Carley will mind one bit next weekend. Pat, should the Lord have plans for you to stay around a few more years, I’m making you pumpkin scones, gingerbread scones, key lime scones, and these little jewels. Blessings! 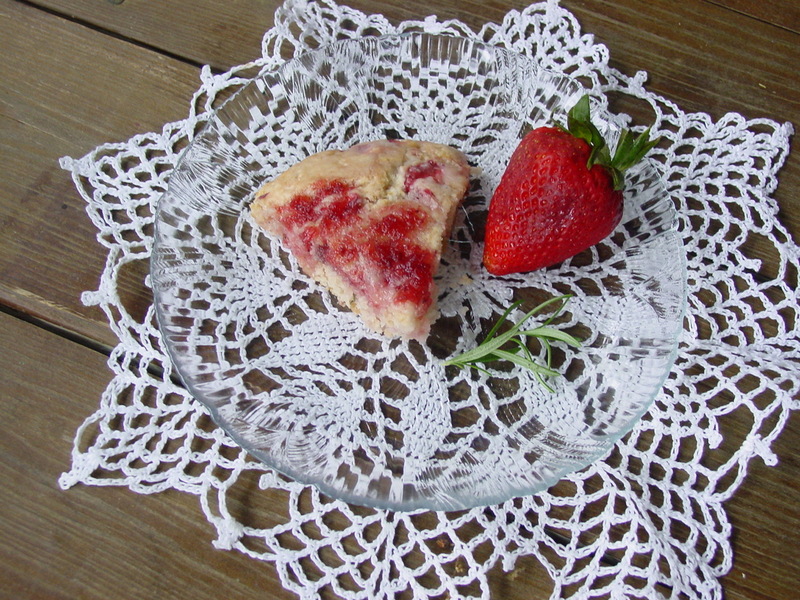 Posted on June 1, 2013 by thymelesssageandrandomrants	• This entry was posted in cooking and tagged Baking powder, Cream, Flour, Pastry blender, Scone, Sheet pan, strawberries, Tablespoon, vintage doily. Bookmark the permalink. First I have to say I love scones. I enjoyed reading how you made them. I haven’t tried leaving only an indentation and not cutting all the way though. I can’t wait to try my new tip. P.S. I love how there is no substitute for butter. I agree. Thanks, Becca. The indention marks make the cutting so much easier when the scones are done. I think glazed pumpkin scones are my favorite. What are yours?